Prenatal vitamins are an important part of a healthy pregnancy, particularly if you are vegetarian or vegan and might be missing some nutrients in your diet. Expectant mothers need higher amounts of certain substances including iron and folic acid in addition to a wide variety of other vitamins and minerals, and a prenatal vitamin can help bridge the gap between a normal healthy diet and the requirements of a growing baby. A recent study even linked taking folic acid before and during pregnancy to a lower autism risk. But what's a whole-food-loving or vegetarian mama to do? Not to worry. We have put together a list of our favorite prenatal vitamins that will work for you, whether you are looking for a whole-food-based supplement, a vegetarian or vegan option, or simply one that won't make you feel even queasier in the first trimester. Plus, we found a few additional natural supplements such as folic acid, iron, and DHA that doctors recommend for complete prenatal nutrition. Before you make start taking a prenatal vitamin, or any supplement, consult your doctor. Folic acid, a naturally occurring B vitamin, in particular is key in the early days of pregnancy to help the developing fetus’s neural tube, which becomes the brain and spinal cord, to develop properly. Research has found that the nutrient helps to avoid the condition spina bifida, in which a baby’s spinal cord is still exposed when he or she is born, which can lead to paralysis and other health complications. Folic acid is so important during early pregnancy, a time when many women may not even realize they’re pregnant yet, the March of Dimes recommends that all women of childbearing age take at least 400 micrograms daily. So even if you’re just starting to think about having a baby, you may want to talk to your doctor about starting a prenatal or multivitamin now that contains folic acid, as this this is one of the most important nutrients to have in a mother’s system when a baby is conceived. You can also take folic acid, or vitamin B12, separately. We love Standard Process’s Folic Acid B12 supplement, which is all natural and whole-food based. Also particularly important during pregnancy are omega-3 fatty acids from fish oil. But since prenatal vitamins don’t typically include these essential nutrients, expectant mothers can take DHA supplements (docosahexaenoic acid, an omega-3 polyunsaturated fatty acid) instead of loading up on fish, which can contain harmful pollutants, and obviously doesn’t fit into a strict vegan or vegetarian diet. Research has shown that DHA is important in fetal development and adequate levels may help with cognitive functioning, brain and eye development. Studies have even linked DHA to a lower risk of both pre-term labor and postpartum depression. We like Spectrum brand DHA supplements, which come in prenatal and vegetarian forms. Ask your doctor to help you decide how much DHA you should take while pregnant. Finally, another supplement you may want to take separately from a standard prenatal vitamin is iron, an ingredient in prenatal vitamins often blamed for the nausea women sometimes experience while taking them. But for vegans and vegetarians who don’t eat red meat, getting enough iron from food sources can be challenging. 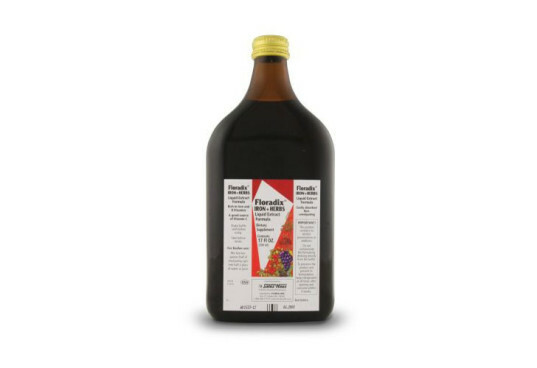 One way to cut down on the queasiness is to take iron in a liquid supplement form such as Floradix. The formula contains other herbs and can be mixed with juice. Floradix is also great to have on hand after childbirth, to help fight any anemia caused by blood loss and to get you back in fighting shape more quickly. 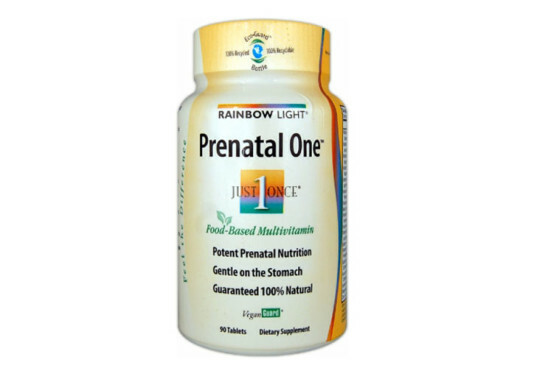 If you start reading reviews online, Rainbow Light’s Prenatal One Multivitamins have plenty of satisfied customers. For starters, you only need to take one pill a day to get what you need while plenty of prenatals must be taken twice a day. Even though the pill contains 30 micrograms of iron, it doesn’t bother most women’s stomachs, which can feel like a miracle. Also inside: 800 mcg folic acid, fresh ginger juice (in dried form), and 25 million bioactive probiotics. The vitamins are 100 percent natural and free of artificial colors, flavors, sweeteners, preservatives and other objectionable additives. Vegans rejoice — Rainbow Light carries the Vegan Guard seal on its bottle. According to Amazon, where the embedded link takes you, the Standard Process Folic Acid B12 product contains: "Proprietary Blend: 350 mgCarrot (root), calcium lactate, bovine liver, porcine stomach parenchyma, defatted wheat (germ), bovine spleen, ovine spleen, bovine adrenal Cytosol extract, oat flour, and ascorbic acid." This is absolutely NOT vegan or vegetarian, How did it get on this list? 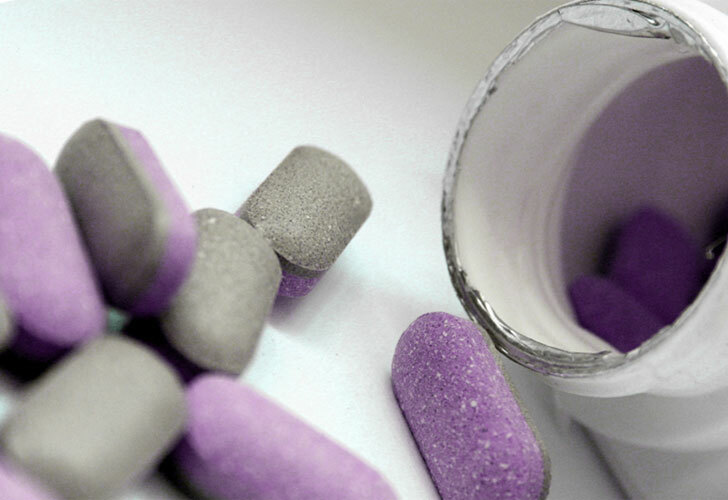 The DHA tablet contains gelatin in the capsule, which is also not vegan/vegetarian. Spectrum does make a Vegetarian DHA with no gelatin, but the one marketed for pregnancy does. Vegetarian/Vegan Moms - Just make sure you are reading the labels carefully. Thanks for pointing that out, Ami16 and comomma_126! It's always great to double check ingredients - something my friends and family get tired of me doing but something that I will always do. I trust no one, haha! I recently found my favorite vegan restaurant started offering new drinks made with carmine. *shudder* The Standard Process website also states the same ingredients for the Folic Acid B12 as the Amazon website. It would be great if this article could be updated. Folic acid, a naturally occurring B vitamin, in particular is key in the early days of pregnancy to help the developing fetus's neural tube, which becomes the brain and spinal cord, to develop properly. Research has found that the nutrient helps to avoid the condition spina bifida, in which a baby's spinal cord is still exposed when he or she is born, which can lead to paralysis and other health complications. Folic acid is so important during early pregnancy, a time when many women may not even realize they're pregnant yet, the March of Dimes recommends that all women of childbearing age take at least 400 micrograms daily. So even if you're just starting to think about having a baby, you may want to talk to your doctor about starting a prenatal or multivitamin now that contains folic acid, as this this is one of the most important nutrients to have in a mother's system when a baby is conceived. You can also take folic acid, or vitamin B12, separately. 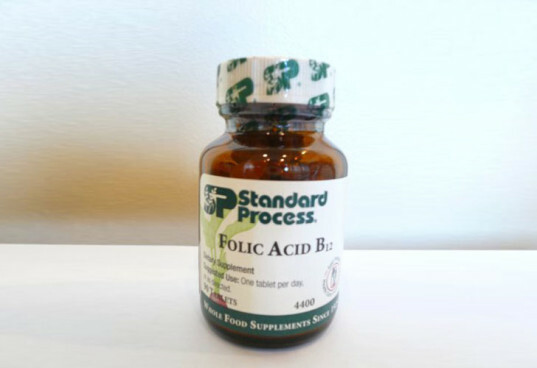 We love Standard Process's Folic Acid B12 supplement, which is all natural and whole-food based. Also particularly important during pregnancy are omega-3 fatty acids from fish oil. But since prenatal vitamins don't typically include these essential nutrients, expectant mothers can take DHA supplements (docosahexaenoic acid, an omega-3 polyunsaturated fatty acid) instead of loading up on fish, which can contain harmful pollutants, and obviously doesn't fit into a strict vegan or vegetarian diet. Research has shown that DHA is important in fetal development and adequate levels may help with cognitive functioning, brain and eye development. Studies have even linked DHA to a lower risk of both pre-term labor and postpartum depression. We like Spectrum brand DHA supplements, which come in prenatal and vegetarian forms. 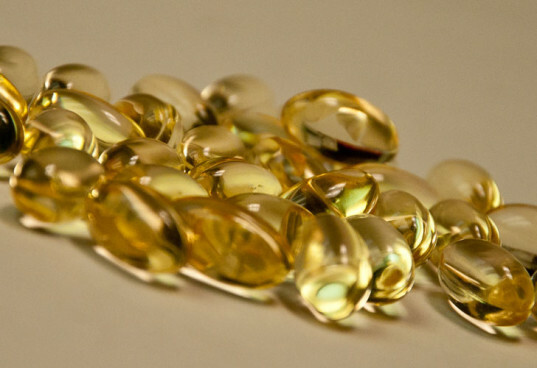 Ask your doctor to help you decide how much DHA you should take while pregnant. Finally, another supplement you may want to take separately from a standard prenatal vitamin is iron, an ingredient in prenatal vitamins often blamed for the nausea women sometimes experience while taking them. But for vegans and vegetarians who don't eat red meat, getting enough iron from food sources can be challenging. One way to cut down on the queasiness is to take iron in a liquid supplement form such as Floradix. The formula contains other herbs and can be mixed with juice. Floradix is also great to have on hand after childbirth, to help fight any anemia caused by blood loss and to get you back in fighting shape more quickly. If you start reading reviews online, Rainbow Light's Prenatal One Multivitamins have plenty of satisfied customers. For starters, you only need to take one pill a day to get what you need while plenty of prenatals must be taken twice a day. Even though the pill contains 30 micrograms of iron, it doesn't bother most women's stomachs, which can feel like a miracle. Also inside: 800 mcg folic acid, fresh ginger juice (in dried form), and 25 million bioactive probiotics. The vitamins are 100 percent natural and free of artificial colors, flavors, sweeteners, preservatives and other objectionable additives. Vegans rejoice -- Rainbow Light carries the Vegan Guard seal on its bottle. 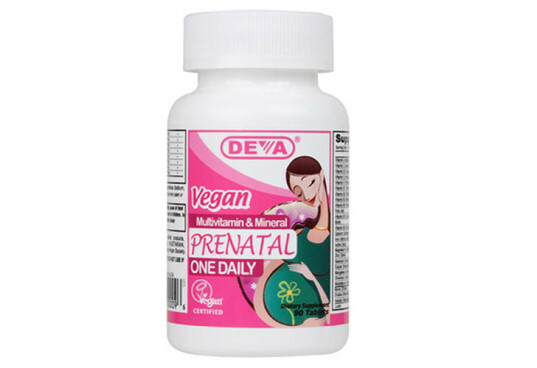 Another vegan-approved once daily prenatal that we like is Deva Vegan Prenatal Multivitamin & Mineral Supplement. Along with 800 mcg folic acid and 21 mcg of iron, this formula contains 1500% of the daily RDA (recommended daily allowance) of B12 a vitamin many vegans have trouble getting from food based sources. Another plus for Deva Prenatals is their inclusion of 100% of the RDA of vitamin D, the much-talked about "sun vitamin." The brand also claims a large dose of "vitamin C helps prevent some of the leg cramps, nausea and vomiting associated with early pregnancy." 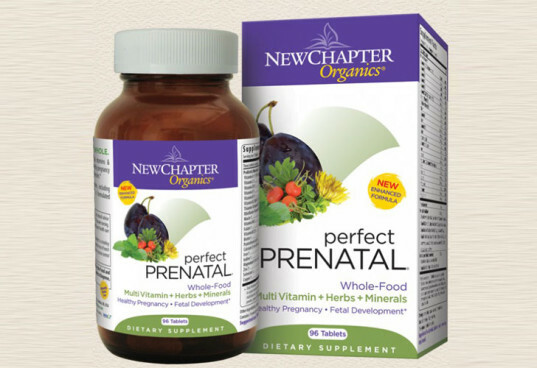 If you can't stomach big pills or multivitamins that contain high amounts of iron, taking three small New Chapter Organics Perfect Prenatals may help. A day's dose of the 100% vegetarian and certified organic supplements provides 600 mcg of whole food folate, 18 mg of iron, live probiotics, and a blend of broccoli, kale and other cruciferous vegetables that according to New Chapter Organics can help "support healthy estrogen metabolism and breast health."